2,4-dinitrobromobenzene is a highly useful organic intermediate. The ortho and para nitro groups relative to the bromine activate it for SNAr reactions with a wide range of nucleophiles, a pathway that is off limits to most conventional aryl halides. 2,4-dinitrochlorobenzene and chlorobenzene are product of commerce, but not readily available to the amateur. Use of bromine to prepare bromobenzene is considerably easier (in my opinion at least) than using gaseous chlorine for chlorobenzene. For all intents and purposes, 2,4-dinitrobromobenzene can probably be substituted for 2,4-dinitrochlorobenzene in any prep (with adjusted mass of course). Preps of 2,4-dinitrobromobenzene are thus understandably scarce in the literature or very small scale1. As shown by user, Axt, the ability of 2,4-dinitrochlorobenzene to react with a wide range of nucleophiles can be used for synthesis of a number of explosives2. However, it holds particular interest for the organic chemist in being able to make 2,4-dinitrophenylhydrazine1,3,4, a reagent for visualizing ketones and aldehydes on TLC plates and as a qualitative test for these groups in solution. In this use, it is known as Brady's reagent and the resulting solid 2,4-dinitrophenylhydrazones typically have sharp and characteristic melting points, allowing identification of otherwise liquid ketones and aldehydes. A second use in organic snthesis is in the Zincke Reaction, where the nucleophile is a pyridine. The resulting 2,4-dinitrophenylpyridinium salt is prone to reaction with primary amines, which result in N-alkyl or N-aryl pyridinium salts. Secondary amines ring-open pyridine to a conjugated aldehyde/iminium salt which can be used in other reactions5,6,7. While this may seem like an elementary prep to the energetic materials crowd, nitrations are a bit like voodoo to some of us and energetics are infrequently characterized to the satisfaction of organic chemists. In addition, the literature is riddled with various terms for nitric acid concentration and no obvious standard definitions for some of these terms. Warning! 2,4-dinitrobromobenzene is a mutagen and powerful skin irritant. Take appropriate precautions to avoid contact with the solid or solutions and dispose of waste in a responsible manner. Sulfuric acid used was putatively 98%, purchased from dudadiesel. Sodium nitrate was material recrystallized from fertilizer advertised as sodium nitrate and is substantially pure. Bromobenzene was prepared by bromination of sodium benzoate-derived benzene in the presence of steel wool and fractionally distilled to yield pure product. Methanol was sourced from HEET gas line antifreeze and was distilled to remove the high-boiling corrosion inhibitor (which is present as less than 1%. A 3-neck, 250ml RBF (a beaker will probably also work fine given proper ventilation) is charged with 130ml (239g) of concentrated sulfuric acid (Do not use less. I tried and the result was not stirrable with magnetic stirring). 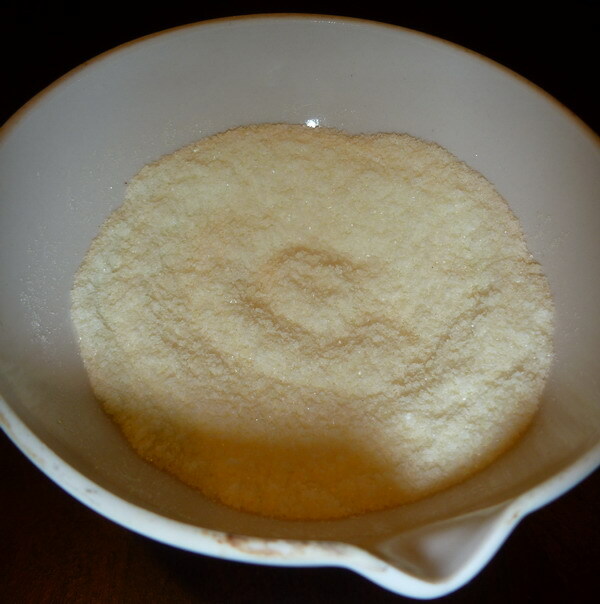 A stirbar is added and 68.00g (0.8mol) of powdered sodium nitrate (substitute KNO3 or possibly NH4NO3 as desired) is added slowly with stirring. This mixture fumes considerably and does not become transparent. 31.40g (0.2mol) of bromobenzene is measured out and transfered to a pressure-equalizing addition funnel placed in one of the flask's necks (or a sep. funnel if using a beaker). The other necks are fitted with a thermometer immersed in the reaction mixture and a gas offtake leading to an alkaline scrubber (unnecessary if working in a hood or outside). Addition of the bromobenzene is carried out slowly, and is highly exothermic. The reaction mixture is not allowed to exceed 70C, but is favorably kept above 60C. Below this temperature the crude product is solid and makes stirring more difficult. After the addition of the the bromobenzene is complete, the flask is immersed in a hot water bath at 85C and stirred vigorously for an hour (temperature limited by very low ambient temperature and maximum hotplate output). Surprisingly little NOx is evolved. Other preps2,4 specify 95C and boiling water baths. Either may likely be used with equivalent results. After the heating period is complete, stirring is stopped and the crude product seperates out as a yellow upper phase. The reaction mixture, while still hot (or else the crude product solidifies) is poured into a liter of ice water containing crushed ice (a slurry of snow is also effective if available). The crude product seperates as chunks and powder with a turbid supernatant. The product is vacuum filtered onto a fritted buchner funnel. The lumps are crushed with a glass stopper and the crude material washed by stirring into suspension with two 100ml portions of cold water. 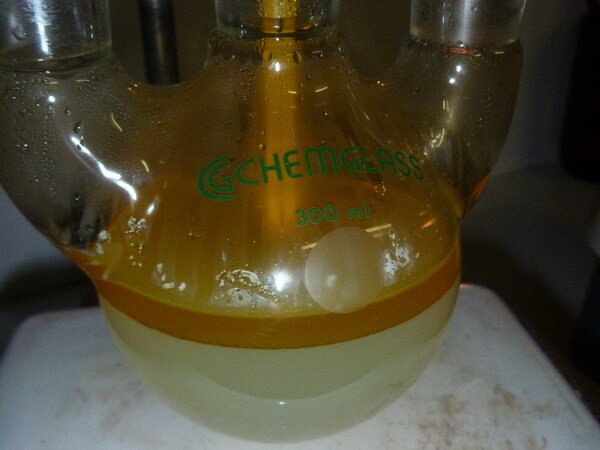 The filtrate is yellow, likely from nitrophenol hydrolysis products. This crude material contains appreciable amounts of contaminants, and melts at 62-69C when dry. It is placed in a beaker, covered with 200ml of water, and melted. The product forms a milky yellow lower phase which is stirred vigorously. The supernatant becomes considerably yellow during this washing. After cooling, the supernatant is decanted, the lumps crushed to powder, and washed on a frit with 100ml of distilled water. Final purification is achieved by dissolving the crude product into a minimum of methanol (about 100ml is required) at boiling, and allowing to cool undisturbed. Well defined pale yellow crystals form. 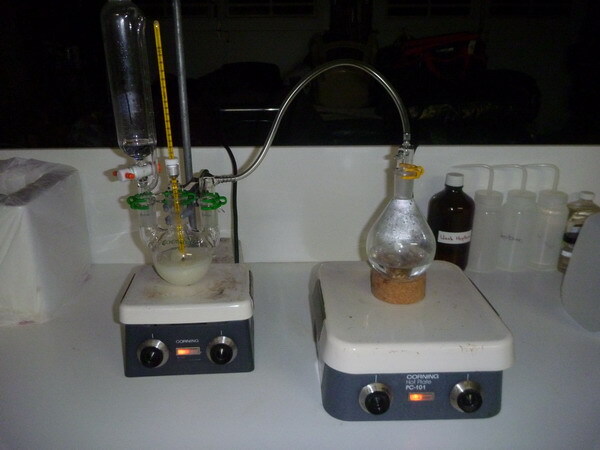 The liquid is decanted and the product ground and dried in open air to yield 41.39g (84% yield) of 2,4-dinitrobromobenzene as a pale yellow crystalline powder melting at 69-72C in a thiele tube (uncorr, lit m.p. 71-73C). The waste methanol solution can be advantageously disposed of by adding excess (~5g) NaOH in 50ml of water and heating for a half an hour, forming a dark red transparent solution. This converts the dinitrobromobenzenes into the respective phenols and should leave any mononitrobromobenzenes unreacted. Distilling the methanol off and dissolving the residue in water will precipitate the latter and after filtration, acidification of the filtrate precipitates mixed 2,4 and 2,6 dinitrophenols with a very broad melting range, but which may still be useful, or can be nitrated further to picric acid. Note: I will not be providing a writeup of the conversion of this material to 2,4-dinitrophenylhydrazine (I also have no pictures and it is almost identical to the orgsyn prep). Substitution of methanol for ethanol is acceptable. The product separates from the cooled reaction mixture as a garnet/wine-red crystalline powder. The alcohol wash from orgsyn should be omitted. Instead suspend and stir the product in twice as much hot methanol as they suggest to rinse with and allow to cool. I found that the small wash was not effective at removing unreacted halide. 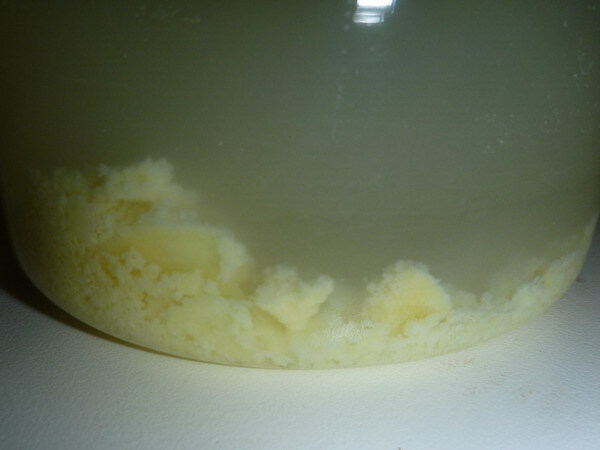 The product is then sucked dry from the yellow supernatant and rinsed with a small quantity of methanol before drying in air. Yield is 78.5% and does not require concentration of the mother liquor for a second crop as is the case with ethanol. A very small amount of non-acid soluble dark material remains when the DNPH is dissolved in acid to make a test solution/TLC spray. I suspect this may be 1,2-bis(2,4-dinitrophenyl)hydrazine or 2,2',4,4'-tetranitroazobenzene. It is readily filtered from the liquid. Are you uploading this to your youtube channel or have you stopped uploading videos? He no longer uploads on YouTube, all though god knows why, his videos are amazing. I am not currently recording any footage or posting any new videos. The sound on my camera is shot and it is a lot of additional work versus simply running a synthesis normally with occasional photos. Also the camera and tripod physically sit between me and the apparatus making maneuvering more difficult and troubleshooting on a new synthesis harder (and if it gets ugly then I scrap all the video anyway). I may upload again, just not right now, and I'd need a new camera first. Any chance of the SciMad community coming together to provide funds for a new camera? What do you think UC? I got a new Casio Exilim FH-20 from a pawn shop for $106, it works perfectly, maybe you should look locally. Considering it costs $1,100 off Amazon, I'd say it was a pretty good deal. Won't 2,4-dinitrobromobenzene react with the water (dinitrophenol) and methanol (dinitroanisole (dinitromethoxybenzene)) in your isolation process reducing your yield and pollute your final product? If you started a campaign on some crowdfunding site, I would donate. You can buy an HD camera for ~$100. @UnintentionalChaos You mentioned that the addition of bromobenzene is highly exothermic, but the starting temp of my addition was 35°C and the ending temp was 38°C? Did you find it to be more exothermic when you did it? Now that I think about it, it might because stirring was slower due to solids, though I was manually stirring at periodic intervals in addition to magnetic stirring. I am very confused with your 3 degree temperature rise. Mine would have probably boiled if the PhBr had been run in rapidly and the mixed acids only started at 20C IIRC. I had the bromobenzene going into the flask at a drip rate of maybe 3 drops/sec and was a little surprised that the temperature didn't rise much. The bromobenzene I was using was reagent grade, though it is probably more than ten years old, is bromobenzene stable in long term storage? Afterwards though, I got a yellow solid melting around 60°C to 70°C, though I don't have a melting point apparatus to be able to get an accurate melting point. This indicates to me that the bromobenzene didn't decompose much in storage, since my crude yields are only slightly lower than yours. PhBr is extremely storage stable. I assume it was a stirring issue in that case, as you seem to have the desired product. I regulated the rate of addition to keep the temperature at about 65C. The drops were immediately dispersed into the mixed acids by rapid mechnical stirring. If you had a seperate upper phase due to slow stirring, the reaction probably proceeded slowly, with the majority happening during the heating phase where it may not have been obvious. I did notice a separate upper phase during the addition. When I was preparing the hot water bath for the heating step, I heated the water in the microwave, then put the reaction flask into it. The water was only at around 60°C at that point, so I put the bath onto my hot plate to warm it up and began stirring vigorously. After the flask warmed up to 60°C, the reaction mixture melted and the temperature shot up to 95°C and started releasing some NO2, so I'm guessing this is where the reaction happened. At this point, the two phases also disappeared. Really solid work here. That's about all I have to say. Happy to see this quality of posting maintained! Just a note for this procedure. When I ran this prep I decided to recrystallize from denatured ethanol rather than methanol because I didn't feel like distilling my Heet. 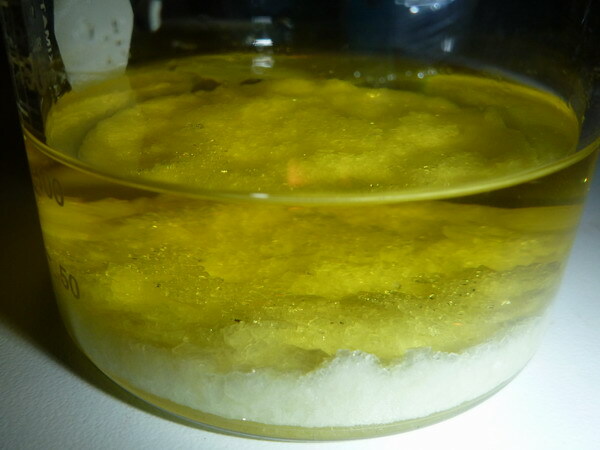 This was a big mistake, instead of crystallizing like shown above, the product became a solid chunk on the bottom of the beaker due to the 10°C difference in boiling point in methanol and ethanol. This was a pain to remove and break up, but I still obtained a fairly decent yield of 38.76g. That's good to know- for use as a solvent, many of us will treat the two alcohols as interchangeable. The lumps are crushed with a glass stopper and the crude material washed by stirring into suspension with two 100ml portions of cold water. 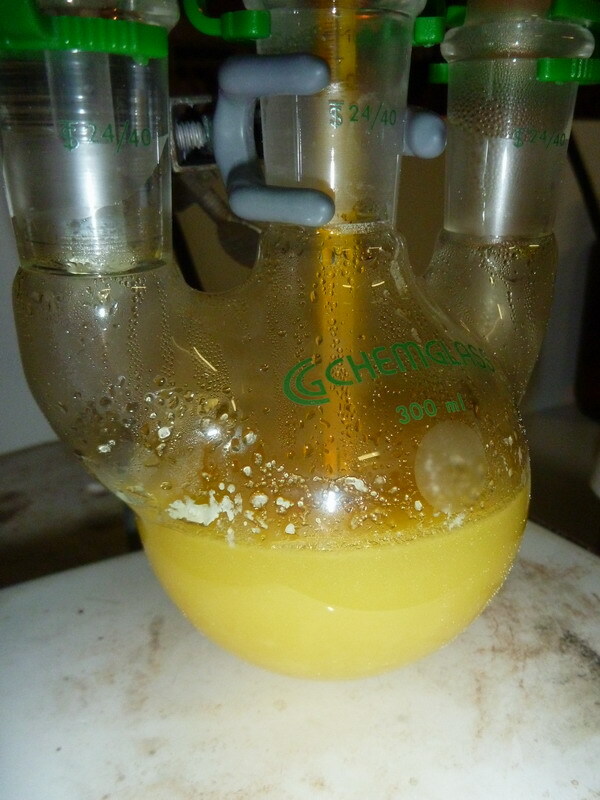 The filtrate is yellow, likely from nitrophenol hydrolysis products. Final purification is achieved by dissolving the crude product into a minimum of methanol (about 100ml is required) at boiling, and allowing to cool undisturbed. Well defined pale yellow crystals form. Actually, leaving group ability decreases down the group for this reaction, due to the rate determining step of the mechanism (SnAr). That means fluorides react fastest, and iodides the slowest. Exactly what he said. The product is insoluble in water, and on heating it melts to form an immiscible organic phase. This can be agitated to remove any aqeuous-soluble impurities, settled, and cooled to give a solid lump of "purified" product. I do concur on the use of recrystallisation solvent. Whilst it may not be an issue, it is never ideal to use a reactive solvent (for the purification), particularly on scale (where things take a lot longer for processing). @gdflp Sounds like you oiled out. Did you just use enough alcohol to give a homogeneous solution at boiling or use a similar amount to the methanol in my writeup? Perhaps adding a little more alcohol would have helped by keeping any material from crystallizing until it was below it's m.p. Alternately, you take it off the heat, cover immediately, and pray that it supersaturates initially. @DJF90 Literature tends to suggest methanol or ethanol (even aqueous ethanol) as good recrystallization solvents for 2,4-dinitrochlorobenzene and 2,4-dinitrobromobenzene. I just double-checked in my copy of "Purification of Laboratory Chemicals, 6th ed." Other suggested solvents are ethers. I think what happened was the solution was saturated at boiling. When it started to cool, it starting coming out of solution above it's melting point. Adding more ethanol most likely would have helped, it would just increase losses from the recrystallization. I think it would take a few tries to get it to supersaturate though.